I don't feel like I want to tie myself to any sort of midweek crafting check-in, but I also don't feel like I have a whole lot to post in the way of "homesteading" right now. As the next couple months go by and we start to thaw out up here, I can think of many a thing to post about. But for now, I'm knitting. 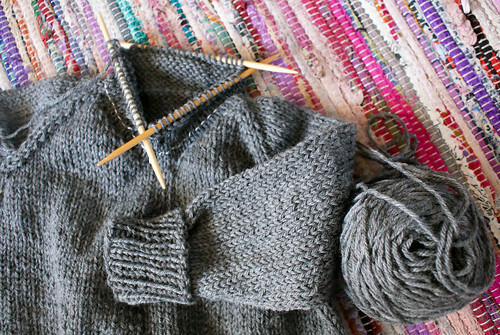 I'm still working away at Asher's birthday sweater. (His birthday was 1/18, and admittedly, I didn't start it til after.) I tend to be somewhat of a practical knitter. Well. I guess I would say, semi-practical. I don't buy the cheapest of cheap yarns (which, probably would wear out sooner anyway) and I ogle over, but don't really buy the pricier yarns. (But I do so daydream about it.) So then, while selecting a yarn for Asher's birthday sweater - color choice must be practical as well- I chose gray. Gray gray gray. Neutral. Hides stains. Manly. Boring. I'm seriously craving some color! And I'm thinking of doing some dying. I've done it once before - with koolaid - and it came out great, but I'm thinking of using something else this time. Have you dyed yarn? What's your method of choice?